Experience the power of OUI with the first make up collection from Juicy Couture. Inspired by the new OUI Juicy Couture fragrance, these limited edition shades are fun, fearless and fabulous. Experience the power of OUI in the first makeup collection from Juicy Couture – exclusively made for Look Fantastic! THE NEW FRAGREANCE Cheeky, playful and forever fantastic. Viva La Juicy Bowdacious invites you into a world of luxe, pink, over-the-top fantasy wrapped in a big pink bow! Pucker up the new Juicy Couture lip collection with a range of products with vibrant decadence and a touch of glitter! 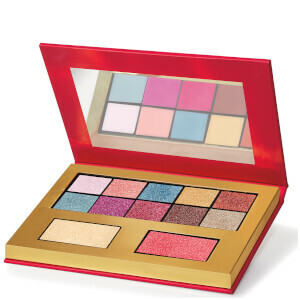 Create your own statement with the new Juicy Couture vibrant eye shadows in a range of pinks, reds and unexpected blues. Fragrances designed for the glamorous girl who is always the life of the party! Juicy Couture is a glamorous, irreverent and fun lifestyle brand for the decidedly fashionable, bringing LA style and attitude to girls all over the world. Embracing its Los Angeles heritage, Juicy discovers the couture in the everyday and delivers an element of surprise in all of its designs. Bringing LA style and attitude to girls all over the world, now live thecharmed life with the scent of a real life Juicy girl and make a statement withthe Juicy Couture Colour collection, exclusive to lookfantastic.